This is a striking variation on a13th century German great helm with a flat top to the skull. This helmet reflects the traditional elements of the classic great helm, with a few extra touches to suit those warrior-kings who might ride into battle. 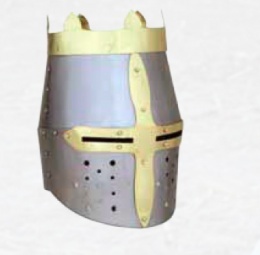 The helmet is made entirely in fine 18 gauge mild steel.The helmet has a polished metal finish, and is adorned with a brass cross over the eyelets, as well as with a basic crown, which is fixed atop the brow of the great helm. Crusaders Knights Helmet, 13th century German great helm with a flat top to the skull. This page was last modified on 13 May 2014, at 16:18.